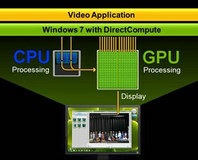 Nvidia has attained WHQL certification for its latest Windows 7 direct compute drive. AMD's ATI Stream SDK v2.0 beta 2 doesn't support GPU acceleration for OpenCL and instead only supports CPUs at this time. 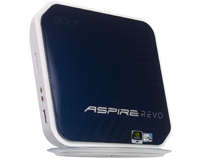 Acer's Revo is the first product we've seen that uses Nvidia's Ion platform, combining GeForce graphics with Intel's cheap and cheerful Atom CPU. It promises smooth 1080p video playback and playable game frame rates for £250 - join us as we find out whether the Revo is able to deliver. 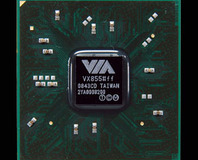 VIA's new VX855 chip features hardware acceleration for H.264 video at 1080p, enabling netbooks to playback HD video. Adobe has released its Creative Suite 4 product family and includes GPU acceleration in Photoshop, After Effects and Premiere Pro. NVISION 2008: Nvidia and Pegasys have announced CUDA support for TMPGEnc 4.0 Xpress and it delivers pretty big performance gains. 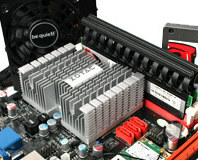 COMPUTEX 2006: Fancy running three graphics cards in your system? A combo deal of two X1900s and an extra X1600 in an Intel motherboard could get you a PhysX-killing setup. NVIDIA has announced the availability of some new PureVideo technologies that are aimed at high-definition video acceleration. These include the H.264 and CV-1 codecs that will be used in the Blu-ray and HD DVD media formats. NVIDIA has replaced the GeForce 6200 TurboCache with the GeForce 7300 GS. For under $100, the card delivers H.264 hardware acceleration up to 1080p - ideal for low-noise HTPCs, as well as gaming at 1280x1024. 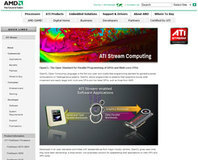 We get the lowdown on the technology and talk to NVIDIA about its plans. CES 2006: NVIDIA is demonstrating H.264 and HD-DVD high definition acceleration using its GeForce 6 and 7 series of chips.